This year’s Interdisciplinary Lindau Nobel Laureate Meeting will bring together a selection of outstanding minds from multiple generations, 3 scientific disciplines, and nearly 90 different countries. Nobel Laureates and young scientists from all around the world in the fields of chemistry, physics, and physiology & medicine will listen to lectures on some of science’s greatest discoveries and participate in discussions about some of the world’s toughest challenges. When the meetings first began after the end of World War II, a frequent topic of discussion was undoubtedly, nuclear energy. Indeed, at one of the first Lindau meetings in 1955, 52 Nobel Laureates signed the Mainau Declaration as an appeal to governments around the world against the use and proliferation of atomic weapons. At this year’s meeting, among the conversations ranging from new chemical reaction mechanisms, to cosmic microwave background radiation, to cell signaling and drug development, there will be a slightly different, but equally threatening, unifying theme: climate change. When you hear the words climate change, you might picture a sad polar bear cub on a melting glacier, a landscape covered in coal-fired power plants pouring greenhouse gases into the atmosphere, extreme weather events destroying homes, or if you’re in the U.S., Kevin Costner, WALL-E, or Al Gore may even come to mind. When you think about the problems that chemists, physicists, or biologists are working to solve though, climate change is probably not the first thing that comes to mind. With physicists, we think of stars and the expanding universe, or a chalkboard full of mathematical equations. With biologists, it’s a lab bench cluttered with petri dishes and microscopes to cure cancer or prevent the next super bug. With chemists, a recent report released by the Royal Society of Chemistry that sought to better understand public perceptions of chemists in the UK, showed that when asked where they thought a chemist might work, 76% of respondents said a pharmacy. 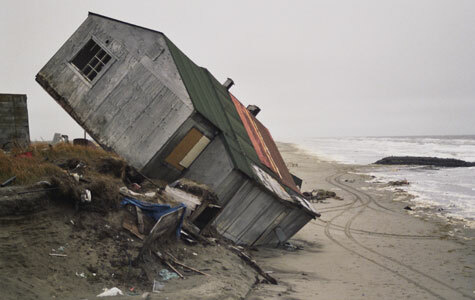 Climate change is one of the most complex challenges of this generation. We often assume that it’s just another “environmental” problem, not dissimilar from air and water pollution or pesticide abuse; implying that we could construct some collaborative effort to “clean up” our resource utilization habits, constrain our release of toxic materials, substitute “green” products for other brands, and so on, and everything will be okay. Climate change is not just an environmental issue though. First and foremost, it is an energy issue. According to the U.S. Energy Information Administration, nearly 90% of the world’s energy is supplied via the combustion of fossil fuels. This combustion process is what releases carbon dioxide (CO2) and methane (CH4), among other greenhouse gases, into the atmosphere, resulting in the warming of our entire planet. The climate change issue cannot be separated from the energy issue. Thus, it cannot and will not be solved within a single discipline, or even within a single nation. It used to be that scientists ran one experiment at a time, replicated it, maybe published it, and then moved on to their next experiment. In the past few decades though, there has been a surge of high-precision tools and advanced data integration techniques that have revolutionized our ability to collect and interpret large amounts of data from complex systems in a short amount of time. Many of these tools have allowed us to look at specific issues relating to climate change. For example, physicists have used supercomputers to visualize plasma dynamics to explore fusion energy applications which could significantly lower our carbon footprint, biologists have genetically mapped entire soil microbial communities to monitor how their metabolism changes and impacts carbon cycling under various environmental conditions, and chemists are creating and using high-resolution analytical technologies to understand and predict how complex molecular interactions may impact or even control global scale climate processes. Young scientists, like those who will be attending this year’s Lindau Nobel Laureate Meeting, are crossing academic boundaries, while simultaneously focusing on the fundamentals in their respective fields, more than ever before. Instead of “sacrificing depth for breadth” as some of the gray-beards will still undoubtedly try to argue, there is a new breed of scientist that is effectively communicating between fields and between cultures to find new applications of pure science with deep and measurable impacts. The disciplinary scientists of the past have come out of their silos and interdisciplinary, collaborative research projects are getting funded more and more frequently. Teams of researchers are successfully sharing and exchanging large data sets, and working together to answer complex scientific and societal issues like climate change. In fact, the U.S. Department of Energy has recently funded a multi-institutional, cross-disciplinary, multi-million dollar project to do just that. The Next Generation Ecosystem Experiments (NGEE-Arctic) project has brought together scientists, engineers, and computational modelers, to combine laboratory and field observations with ecosystem models, to predict and quantify the response of physical, ecological, and biogeochemical processes to atmospheric and climatic change from molecular to landscape scales. This massive undertaking aims to ultimately enhance the robustness of global climate projections which would allow policymakers to make more informed decisions based on reliable scientific data. 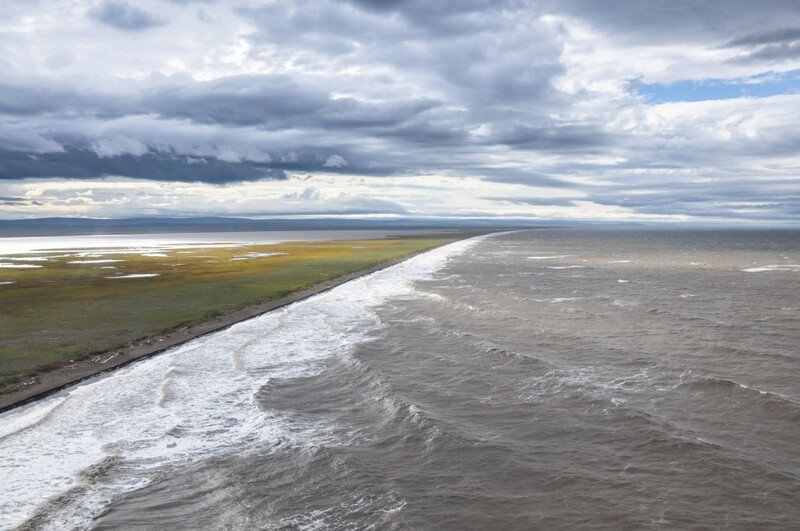 When I first decided on a career in chemistry, no one could have told me that one day, my work would bring me to northern Alaska, where I would find myself walking along the coast of the Beaufort Sea, listening to an Iñupiat whaler describe how his family’s ancestral lands and sacred burial grounds are now submerged beneath the rising waters of the Arctic Ocean because of human activities. Certainly no one could have told me that my research, sitting at the interface of chemistry, climate science, and public policy, may impact how we predict what will happen to those lands in the future. Characterized not only by its pristine beauty and harsh winter weather, the Arctic is known for its vast stores of carbon and for already showing dramatic impacts of climate change as it continues to warm at a rate twice as fast as the rest of the planet. In fact, it has recently been estimated that Arctic soil organic matter—dead plants and animals that have been slowly decaying for millennia—contain more than twice as much carbon as what currently exists in the atmosphere. Map of the 1950-2014 temperature trend showing disproportionate warming in the Arctic. 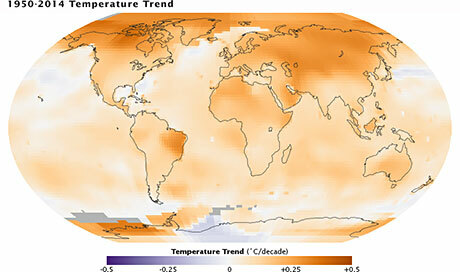 Image Credit: NASA/GSFC/Earth Observatory, NASA/GISS. 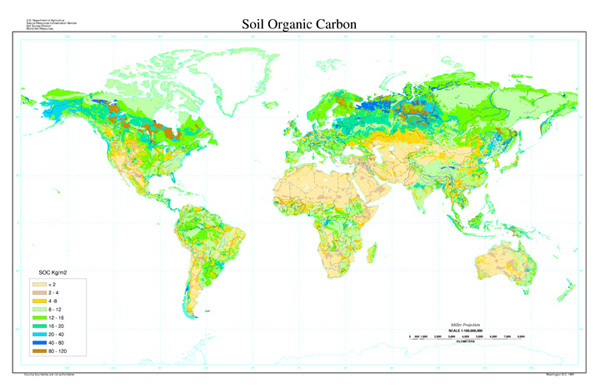 Map of the distribution of soil organic carbon showing a concentration at northern latitudes. Image Credit: FAO-UNESCO, Soil Map of the World, digitized by ESRI. Soil climate map, USDA-NRCS, Soil Science Division, World Soil Resources, Washington D.C. Soil Pedon database, USDA-NRCS National Soil Survey Center, Lincoln, NE. Rising temperatures are expected to thaw some of this organic matter and also increase decomposition rates. As the organic material is broken down by microbial decomposers, the amount of CO2 and CH4 being released from the soil may increase, which could convert the Arctic from a “sink” for atmospheric carbon into a net “source”. More carbon being released from the soil in the form of these potent greenhouse gases could lead to more warming, ultimately creating an irreversible positive feedback loop. This is one reason why many refer to the Arctic as a tipping point, and why some of the potentially serious consequences that may result have drawn the attention of scientists, and politicians, from around the world. 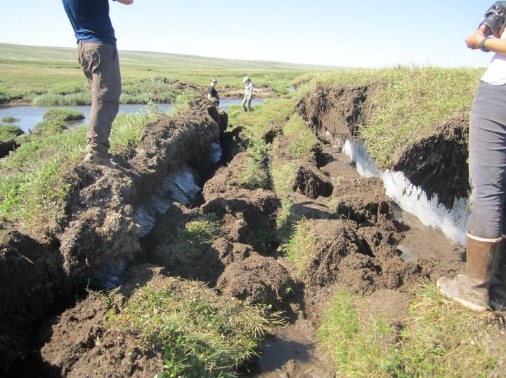 Rising temperatures in the Arctic have led to rapid thawing of permafrost soils, leaving large scars on the landscape like this thermokarst feature near the Arctic Circle. Previously frozen organic matter is now exposed to warmer conditions and sunlight, where it begins to breakdown and release carbon in the form of CO2 and CH4. Also stored alongside all that frozen soil organic carbon however is a limiting nutrient that both plants and microbial decomposers compete for—nitrogen. If plants are capable of taking up organic nitrogen, and can outcompete the microbes for this pool, this could enhance their productivity—carbon intake via photosynthesis—which would help maintain these soils as a sink for atmospheric carbon. Understanding how nitrogen availability will respond to warmer temperatures in these systems is critical to our ability to project future global climate scenarios. As part of this project at the U.S. Oak Ridge National Laboratory, my doctoral research investigates how organic nitrogen availability changes over time and space in the Alaskan Arctic. More specifically, I’m developing high-performance analytical chemistry techniques to be able to monitor shifts in the amount and chemical composition of this highly dynamic pool across various landscape gradients, at different soil depths, and under warming conditions. This work will generate high-resolution, molecular-scale data that will be used to inform microbial decomposition models, as well as generate insights into the conditions necessary for various Arctic plants to effectively compete with the microbial community for this organic nitrogen pool. In addition to my lab and field work, I recently spent time working with the Woodrow Wilson International Center for Scholars, a nonpartisan policy forum that addresses global issues through independent research and open dialogue. While there, I was able to gain valuable experience in applying my scientific background to actionable policy ideas for Congress, the Administration, and the broader policy community. Chemists, physicists, and biologists alike offer a new perspective to public policy discussions, and innovative graduate programs are now making it possible for graduate students in the sciences to train in both, earlier in their careers. 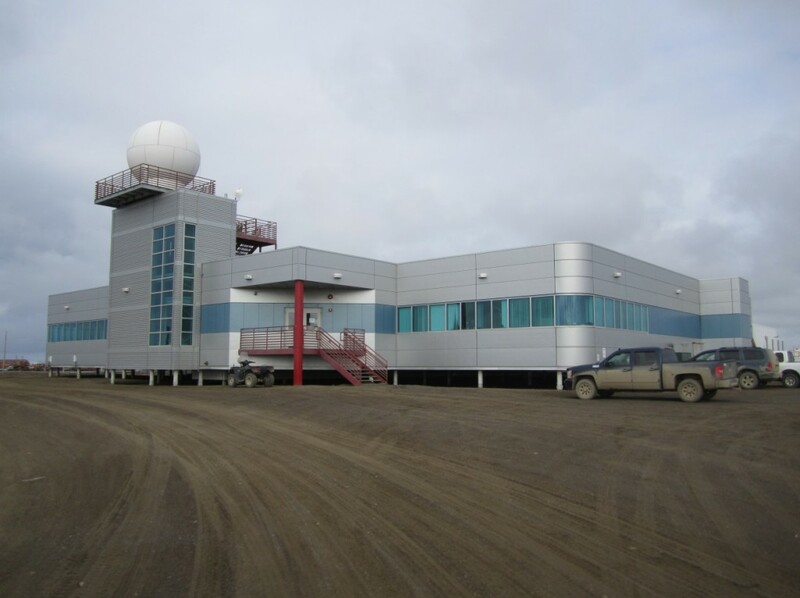 The Barrow Arctic Research Center on the Barrow Environmental Observatory where the NGEE-Arctic team has spent the last 4 years collecting data on landscape characteristics, hydrology, vegetation, and biogeochemistry for the various high-resolution models. In the past few years, new interdisciplinary graduate degree programs have brought together scientists and engineers from many different disciplinary backgrounds into one program to conduct their scientific research, and also pursue their interdisciplinary interests. At the University of Tennessee, the Bredesen Center for Interdisciplinary Research and Graduate Education has designed a doctoral curriculum that allows students to complete their work in lab and pursue either public policy or entrepreneurship as it relates to their scientific research. Some students work with legislators to apply their research to the policy discussion while others are developing technologies and working with local businesses to scale their product and push it to market. The University of North Carolina School of Medicine now has a program that allows life-science PhD candidates to complete a 2-year science educator certificate program at the same time to prepare them for a teaching-intensive career. Many universities, in the U.S. and around the world, now offer dual degree programs that allow science graduate students to also pursue a Master of Business Administration (MBA) at the same time. At this year’s Lindau Meeting, Nobel prize-winning interdisciplinary scientists—including Drs. Stefan Hell, Eric Betzig, Steven Chu, Martin Chalfie, William Moerner, and Ada Yonath, just to name a few—will give lectures and meet with the young scientists of tomorrow to discuss how we should approach interdisciplinary work in the future, what the challenges are in doing so, and why it is so important that interdisciplinary research continues, so that we may address the increasingly complex, global societal and scientific problems that lay before us. 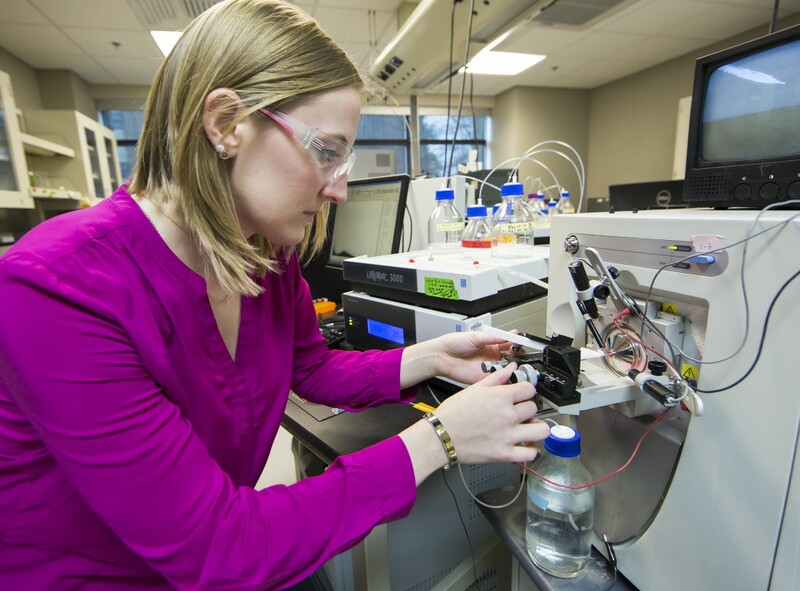 Mallory Ladd, Lindau Alumna 2015, is a National Science Foundation graduate research fellow at the U.S. Department of Energy's Oak Ridge National Laboratory (ORNL) pursuing her PhD in Energy Science and Engineering through the Bredesen Center at the University of Tennessee. Her research with the Next-Generation Ecosystem Experiments (NGEE) project at ORNL examines how terrestrial nitrogen availability impacts carbon cycling in Arctic soils using high performance mass spectrometry. Mallory is attending the 65th Lindau Nobel Laureate Meeting this week as a Young Scientist.